my take: I am a confirmed sucker for all things Jane Austen...finishing the Pride and Prejudice story? a movie based on Emma (Clueless)? a t-shirt that says "I am Mr. Darcy"? yes. yes. yes. So I'm all in for the re-writing series for her classics (and other classic novels). And I love Alexander McCall Smith. Put the two together? Good clean fun. The plot mostly follows Ms. Austen's original with a few minor changes and lots of modern additions (gym membership, university attendance, fancy cars, and climate change). 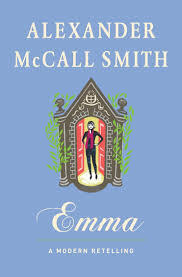 I loved the quaint, plucky language Mr. Smith uses to give the formality of the classic Austen era - the writing was delightful. If you haven't read Alexander McCall Smith's The No. 1 Ladies Detective Agency go do that. Looking forward to borrowing this off your shelf... Enjoyed Sense & Sensibility but more interested in seeing how the Alexander McCall Smith style turns out.